Marked as Fire King 463 USA. 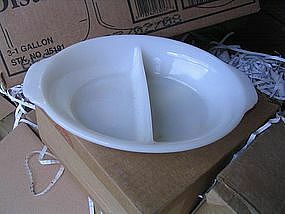 Solid white divided casserole. No chips, cracks, breaks or rough rim. I am not seeing any scratches to the interior or exterior. I need your zip code to calculate the postage.